What is an Awarenesses Outing? It started as a simple idea for high school and college teams to wear the Kids & Dreams DREAM BIG motto on their warm up jerseys as a way to bring awareness to autism and anti-bullying. Outings vary from teams simply wearing the jerseys, a half-time public service announcement about the Foundation, Aaron talking to teams prior to the games, split the pot, raffle, and bake sale fundraisers, merchandise sale tables, etc. have all been incorporated into the outings. The outing is completed with a team picture showing off the DREAM BIG jerseys. Outings quickly spread from the Tri-Cities area, statewide in NE, and nationwide with college teams in NE, KS, OK, MO, CO, TX, and CA. The Kids & Dreams Foundation is extremely grateful for the support of all these schools in spreading awareness! Special thanks to UPRISE DESIGN for designing, printing, and shipping our shirts to all these locations! Below are some pictures of teams from the outings over the past few seasons along with testimonials from the schools! We would love to add your school to this new group! If you are interested, please email us at aaron@kidsanddreams.org. The Palmer Tigers had an awareness outing on January 6th! We are very thankful for their support and wearing our Dream Big shirts during the season. Aaron Bly's son, Trae, even got to attend the game and have his picture taken with the team! 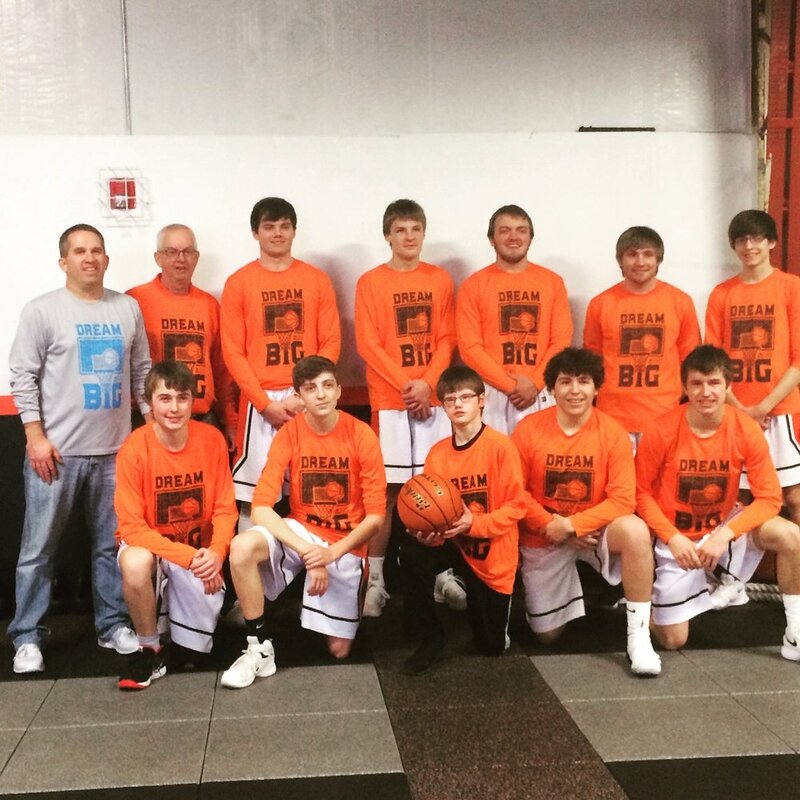 The Kearney Bearcats boy's basketball team rocking our "Dream Big" shirts!! Very grateful for their support! Aaron Bly, founder/Executive Director of the Kids & Dreams Foundation had a chance to speak to with the Kearney Bearcats boy's basketball team before their game vs North Platte about our mission & his journey as a dad with a son who has autism. Dream Big! Photos courtesy of Doug Koster & Bearcat Pics. 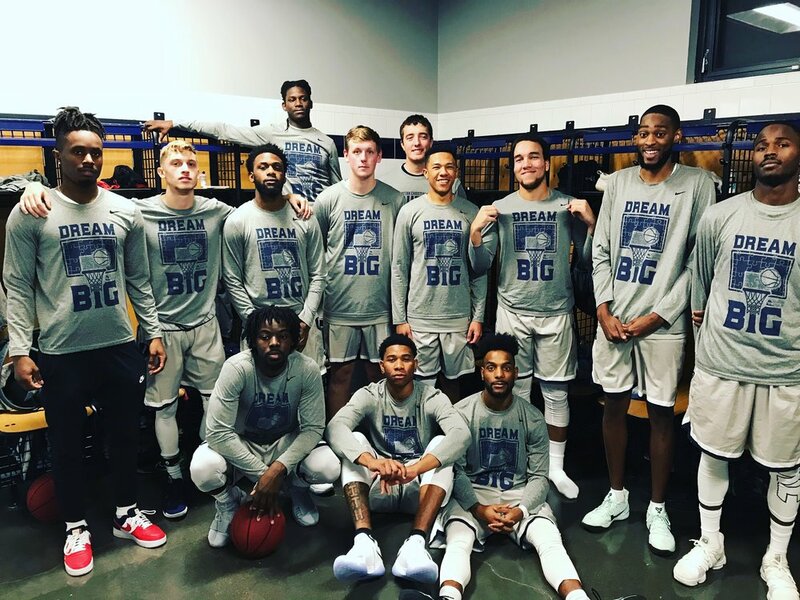 The two time defending NCCAA National Champs, Randall University men's basketball team, is wearing our Dream Big shirts again this year! The Saints were one of the first schools to come along side us and help us spread awareness. Truly grateful for their help & support! The Randall University women's basketball team is one of our new additions as they wearing our shirts this season. Thanks so much to the Saints for helping us spread awareness. Dallas Christian College, one of our new schools this season, is helping us raise awareness in Texas by wearing our Dream Big shirts! Big thanks to Coach Jordan Strom for helping us partner with them this year! 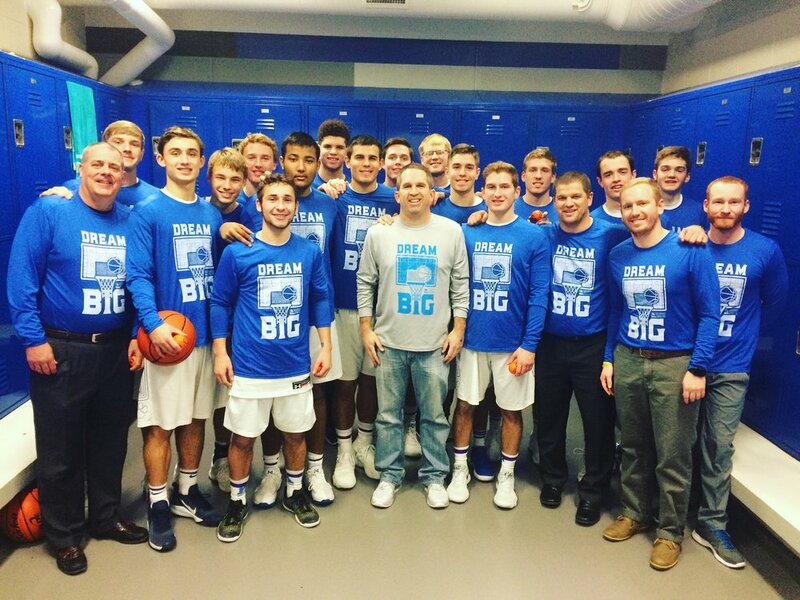 The Manhattan Christian College Thunder are wearing our Dream Big shirts again this season. Truly grateful for their support! Thanks for dreaming big with us! 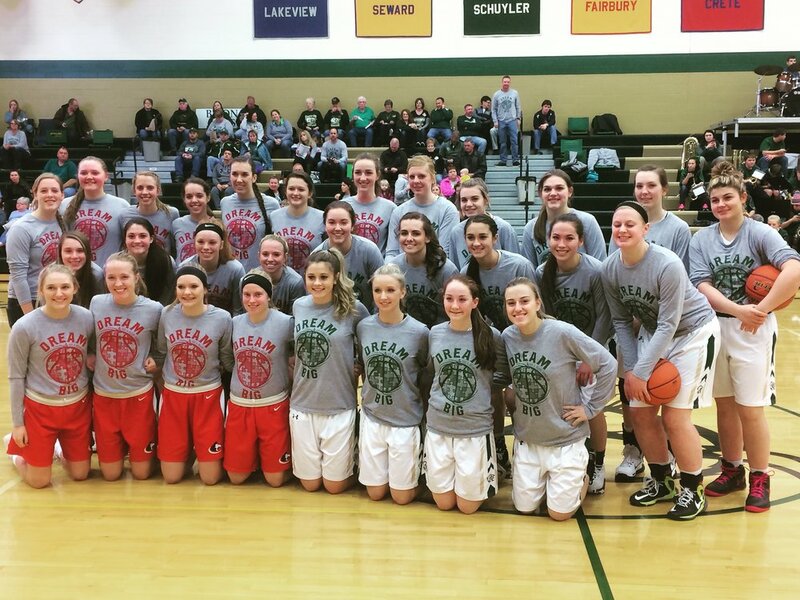 The Shelton Jr. High girl's basketball team wore our Dream Big shirts during their season! Thanks so much to the Bulldogs for the support! Congrats on a great season! The Randall University Saints volleyball team helping support our mission by wearing the Dream Big volleyball shirts at the national tournament. We are grateful for their support! Congrats on a great season!! DREAM BIG DAY!!! It was an honor to speak to the students at Pacifica Christian last year during their Wedge Week activities. We are truly grateful for their support and helping us spread awareness! The Pacifica Christian Tritons wore our Dream Big shirts last season during their Wedge Week and "Dream Big Day". We are grateful for their partnership and the support they have provided. The Sandy Creek Cougars were one of the first teams to wear the Dream Big shirts. Last year, they rocked the black and red shirts! We are truly grateful for all their help and support over the years. Excited for our outing there this month! The Ozark Christian vs Manhattan Christian awareness outing game was great last year! Both team rocked our Dream Big shirts to help raise awareness. Grateful for the support of both schools! The Manhattan Christian College Thunder wore our shirts last year and had an awareness outing for us. It was a great night! Thanks so much to Coach Condra and his team for their support. The Aurora vs Central City Awareness Outing was one of our highlights last year as both teams wore our Dream Big shirts to raise awareness. What an awesome night!! Thanks so much to both schools for their support! The Grand Island Central Catholic Crusaders were one of our new schools last year! Grateful for their support and wearing our Dream Big shirts!! Excited to do another outing at their game this year! The Colorado Jam travel team helped us spread awareness in their state this past year during their tournaments!! Very thankful for their support and wearing our Dream Big shirts. The Kenesaw Blue Devils had us over for an outing last season. Trae and I even got to speak to the team before the game! Grateful for the support! The defending NCCAA National Champs, Randall University Saints, rocking the "Dream Big" shirts and helping us spread the word for the third season! Dream Big! Kids & Dreams Night at Randall University with the Ozark Christian College Ambassadors. Great night in Moore, OK. Love the support! The Manhattan Christian College Thunder helping us spread the word about autism & bullying! We appreciate your help. DREAM BIG! "No Limit" travel basketball team wearing their cool looking Carolina Blue & Red "Dream Big" shirts!! Thanks so much! "No Limit" travel basketball team helping us out with their sweet looking orange & blue "Dream Big" shirts! The Maxwell Tigers girl's basketball team helping us out by throwing out autographed "Kids & Dreams" stress basketballs. First trip to Western Nebraska as we had an outing at Maxwell Public Schools. Dream Big! One of FIVE new schools that partnered with us during 2015, the Pacifica Christian Tritons (in Newport Beach, CA) helped raise support and funding during their week long "Wedge Week". Truly grateful for their support & look forward to working together in the years to come. Dream Big!! We had a great time at the Kenesaw Blue Devils awareness outing. Trae & I even got to speak with the team! Battle On!! Big shout out to the Sandy Creek Cougars & their support! Even was able to have Trae join us for this "Dream Big" outing! Arapahoe Warriors girls basketball team helping us spread awareness with their Dream Big shirts and outing! Thank so much! Adams Central Drum Line rocking out & wearing our "Dream Big" shirts! One of the coolest things at all our outings was getting to listen to the drum line during halftime! Thanks for the support! The Adams Central Cheerleaders helping spread awareness by wearing their "Dream Big" shirts during the outing too!! Adams Central Awareness Outing-The foundation wants to thank Adams Central Public School so much for their support. Dream Big! The Riverside girl's team helping us spread awareness. Thanks so much Chargers!! Good luck the rest of the season! Riverside Chargers "Dream Big" Awareness Outing-Love the bright yellow & blue shirts! Go Chargers! Aurora Huskies Robotics team rocking their "DREAM BIG" shirts!! Thanks so much for your support. The Kids & Dreams Foundation branched out to football during 2015. The Concordia University Bulldogs football team had an "Kids & Dreams" outing during their game against Hastings College. Thanks to both colleges for helping us spread the word! Dream Big! One of our new awareness outings took place at Lyons-Decatur Northeast!! It was AWESOME to add this new school. Dream Big! The Shelton Bulldogs continued to help us spread awareness about autism & bullying! Thank you! Dream Big!! Ozark Christian College Ambassadors rocking the "Dream Big" shirts during the 2015-2016 season. Thanks for the support. The Ozark Christian Lady Ambassadors helping out the foundation during the 2015-2016 season! Louisville High School "Awareness Outing" during the volleyball season in 2014! Hastings Lady Tigers Volleyball "Awareness Outing" in 2014! The Lady Cougars from Sandy Creek helped us by wearing the "Dream Big" shirts all season! Thank you so much! We had a great night at the Sandy Creek outing! Sandy Creek Cougars "Awareness Outing" on January 9, 2015. "As a coach and teacher you understand that your job is much more than teaching history, geography, dodge ball, or even basketball. You are always looking for ways to show kids that life is about so much more and you look for ways to prepare them for life and how to be outstanding citizens once they leave you. Over the years Sandy Creek schools and our high school athletic teams have always been willing to support a cause that especially affects kids as a way to help teach about life to our student athletes beyond the hallways and the court or field. We have promoted games for Cancer Awareness, Duchene Muscular Dystrophy, and our volleyball team helped raise money for a kindergarten student that has special needs and requires the use of a special lift chair. When Aaron contacted me last spring about doing an awareness game this season for Kids & Dreams we were both honored to be asked and more than willing to help out. The Boys and Girls Basketball teams have worn the Dream Big shirts all season and are proud to promote such a worthy cause. Bullying and Autism are things that our students see first hand daily with the struggle of a few of their classmates who suffer from this disability. It is a great way to show our support for these kids and the cause Kids & Dreams represents and also to give back in a very noticeable way. Once our kids were told of the mission of Kids & Dreams they were very proud to be apart of spreading that message and help promote the foundation. Even by just spreading the word in our hallways we have brought awareness to the needs of two students in particular and have made the students more aware of how not only to help them, but also to accept them and look out for them. We are proud to carry the Kids & Dreams Foundation message and what it stands for!" Hillsdale Baptist vs. Ozark Christian-January 31, 2015-Two Teams...One Game....One Cause! Ozark Christian Ambassadors-The college wore our "Dream Big" shirts all year long to help spread the word! Thanks Coach Lahm! Hillsdale Baptist College Saints-They wore our "Dream Big" shirts during the entire 2015 season to help spread the word! Thanks Coach Berokoff! "Having our men's basketball program where the dream big shirts was an honor, it was an honor to be able to represent an organization that is doing such big things and making people aware of autism and bullying." "Riverside Public Schools was please to host Aaron Bly and his Kids and Dream Foundation. The foundation does a great job working with schools to help spread the word on Bullying and Autism. At our school we had many parents take time at Aaron's booth and get more information on what his foundation can and will do. Riverside will be happy to do it again next year and I would recommend letting Aaron come out to your school and help spread the word." Superior High School Awareness Outing on February 13, 2015. Here we are with the Wildcat Boy's Basketball team! The Wildcat girl's basketball team from Superior during our outing! We had a great night spreading the word about our mission! The Shelton Lady Bulldogs helped us spread the word all season by wearing our "Dream Big" shirts. Thank you so much! We really appreciate it! Go Bulldogs! The Bulldogs from Shelton helped us spread the word during the 2014-2015 season. Thanks so much Coach Donner!